Thanksgiving is the time of year we reflect on all the good things in our lives. Family, Friends, Food, Fun, and, of course, Cycling! Family: This year many fathers & sons and entire families rode together. What a great way to spend time with your children; No phones or other devises to get in the way of talking. Several couples rode together this year too. Bike dates are the best! Remember to tell your family thanks for encouraging you to ride. Friends: Long lasting friendships have begun with people enjoying the sport of cycling together. The photo above is one of the last rides Jim Herron shared with us before he moved to Colorado. Jim plans to come back and ride with us as often as he can. Throughout this year, we have had several friends return to the area for a visit and to join us on a bike ride. Old friends say how much they miss the beautiful area here and we say how much we miss them. Thanks for the pulls, drafts, encouragement & thoughtfulness. Food: This year we enjoyed breakfast, lunch and coffee rides. Sharing a cuppa or a pancake is a great way to get to know each other better. Thanks for the good times around a table. Fun: Beautiful scenery, sharing your newest bike gadget, the thrill of riding up and down our hills and valleys, jokes & laughter (Bob jokes never get old). Thanks for the camaraderie. 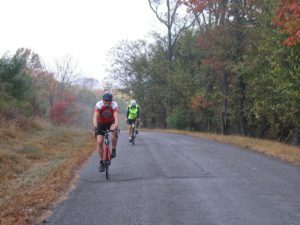 As you gather for Thanksgiving this year, remember the relationships formed and the good times had while zipping down the road or trail via bike. Happy Thanksgiving to all! This entry was posted in Current Events, Ride Reports, The Right Side of the Road and tagged Cycling, Thanks on November 13, 2017 by juliah.